Monsoon, as much as I love the season I hate to admit that it makes me lazy. The pitter patter raindrops on my windowsill makes me curl on the sofa with a good book and a steaming hot cup of coffee. Till this it was ok but it also makes me or rather the whole family crave some good food, something fresh, hot and spicy. But with a small kid and demanding jobs its always not easy to go out on weekdays, especially in these muddy puddly roads around our locality. So as a best measure we order food from our nearest South Indian restaurant, which seems like the only option for us. In the last couple of weeks we ordered from it so many times that finally the 4 year old in the family objected for yet another order of Masala dosa. So just to find out new restaurants I searched for online food delivery and chanced upon this beautiful website of Foodpanda. Which is a huge network of ordering food online across the world. 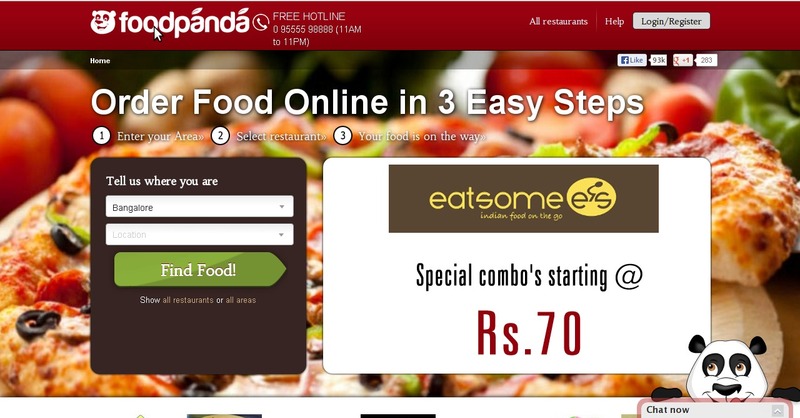 Through them ordering food from the comfort of your home is as easy as counting 1-2-3. You enter your post code, choose from their huge array of cuisine type, price range, Restaurants or delivery hours, then you simply go through the menu of your chosen restaurant and order. The best part is their home page is always updated with all the ongoing discounts and offers from all the restaurants throughout the cities. If you are not much of an internet user or in a situation without any connection you can even order food from your phone. And unlike other online services you don’t even need to have a credit card, rather you can simply settle for cash on delivery option. To make it easier they have their hotline number open from 11 A.m to 11 P.m.
Their huge network covers many countries all over the world and in India presently they are catering to the needs of Delhi, Faridabad, Greater noida, gurgaon, Gaziabad, Jaipur, Mumbai, Chandigarh, Mohali, Pune, Hyderabad. Too bad for me that they are not yet here in Kolkata. The fact that I liked most is it’s a very well thought out concept and the website itself is very easy to access and user friendly. They have not loaded the page with unwanted information rather has concentrated only on those facts which are necessary for food orderings and enjoying them in the comfort of your home. So if you are someone like me who wants to enjoy varieties of food on a regular basis and too lazy to cook it yourself then your best bet could be Foodpanda. As for me am eager to try out their service and look forward to the day when they will extend the same to my city. @Arka, First of all thanks for your comment but if you really need to communicate then please leave a link or an e mail id for that. as for this post, This is a review of their website. I never mentioned or claimed it to be a review of their service. I have been clear in my post that I was not in a position to avail it. What I wrote is my observation and you have every right to disagree. but please do not dismiss other's just because you want to. Thanks. I like this kind of facilities when I feel lazy too:) Nice review dear. I too order online most of the time through a few food chains, than going...waiting and driving back after a heavy meal:) Best wishes to this site too!